Researchers are developing seismic performance factors for cross laminated timber buildings in the United States. U.S. Department of Agriculture Forest Service. Snapshot : Cross-laminated timber (CLT) buildings are becoming popular in earthquake regions of the United States, but structural engineers need new design methods. 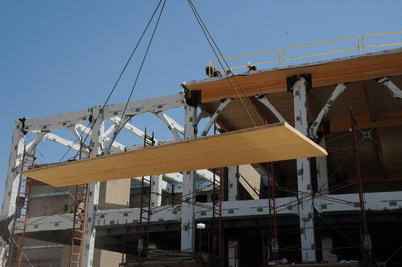 Forest Service research is striving to develop methods to design CLT buildings to six stories and beyond that will withstand earthquakes. Tall wood buildings, built with cross-laminated timber (CLT), are being constructed all around the world and getting exposure in the Pacific Northwest of the United States. One significant barrier in the Pacific Northwest for CLT buildings is the need for the building design to withstand an earthquake. One widely accepted design approach uses equivalent lateral force design and seismic design parameters. For CLT building, no seismic design parameters exist. At the November 2015 Mass Timber Conference, this void was identified as a critical need to advance tall wood building in the United States. A cooperative on-going international research effort is underway to develop and validate a seismic design methodology for CLT panel buildings of approximately 12 story height. The integrated research effort incorporates the development of design requirements, classification of the building archtypes, advance structural testing, and nonlinear dynamics modeling. The ultimate outcome of the project will be universally accepted seismic performance factors for CLT in the United States, which will then be available for use by engineering designers in seismically active regions where such guidelines are mandated. A secondary outcome will be the methodology to follow for how future component changes can be incorporated into the design of CLT.